In a world that is continually growing, we all can now connect globally to each other through the internet. A lot of us have even taken on the task of learning as many languages as we can so that we will be able to communicate with our foreign friends on their level. The opportunities are endless. Even much more than we may have considered when we were just average Americans, Asians, or British without current technology and residing in all our unique parts of the world doing the basic chores of surviving life. Furthermore, an average person from any part of the world back 30 years ago would probably feel no connection with the outside world and realize that their part of the planet was as far as they were going to get. Not because we weren’t schooled to know that other places exist, however, if you weren’t a wealthy person, then you couldn’t just jump on a plane and fly to other lands to find this out. To open myself up more to this discussion, there were places as I grew up that I would hear about or see on television that would spark my imagination about if I would ever get to go there. I never thought so, but I am more hopeful in today’s world. It seems that many have now structured their lives and have found ways to incorporate a trip to foreign lands into their own lifestyles. It takes a bit of planning ahead, but more people are making it a possibility now. Even though our travel opportunities have since broadened, there remain people who do not feel the need or have the time to plan out such a trip, yet still would like to explore different languages as they may have made friendships through social media or work with people from different cultural backgrounds over the internet. Therefore, the expansion of our own language skills is becoming more important to most of us. Although we all might approach the way we learn differently, if we plan to travel outside of our homeland or have these types of friendships online, it inevitably will become an important option for us to acquire, at least, a basic understanding of a language in which we plan a destination to or if we make friendships outside of our own country through virtual conversations. Today, thinking about the different languages and places I would love to explore, Sweden came to mind. So, I thought I would talk a little bit about the language of the Swedish people. Maybe some of you are planning a trip to this beautiful country, and if an extended stay is in your future, it may be of benefit to already know the language before touching down in this lovely countryside. How quickly can you learn Swedish? Can you learn Swedish in one year? These are basic questions. Even so, they are questions that need to be thought about in a focused way. How quickly can you learn Swedish? The easy answer to that would be; it is all up to the person who is learning this language. If you don’t know one single word of the Swedish language, then already you will need to give yourself some valid time to learn it. I’m not saying that a year is not enough time, nevertheless, it may be the minimum amount you will need. To put a positive outlook on learning the Swedish language if you are already a scholar in the English language, the good news is that you should pick this language up fairly easy. 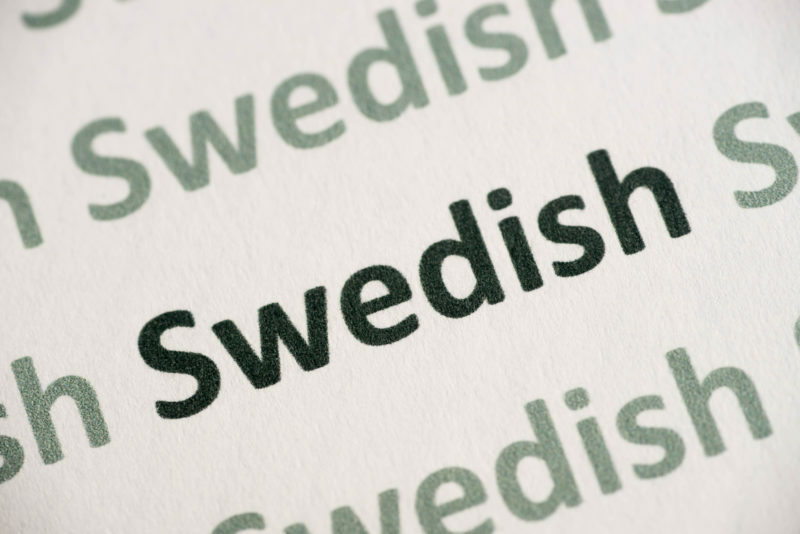 As for an English speaker, Swedish is easier to understand and grasp than, say languages such as German or Dutch. No doubt, these words are most likely the easiest to learn, however, if you can remember them quite fast, then you may be a quick study. Can you learn Swedish in a year? Well, the answer is still up to you – the student. As we go back over the question; can you learn Swedish in one year? To answer that question, these focus tips have, hopefully, helped you come to a point of preparation to answer that for yourself. Because let’s face it, you know yourself better than anyone, and you alone will have to set your own timed goal to achieve this task or any type of task that you take on. In addition, learning a language like Swedish may motivate you to want to master other more complicated languages. Who knows, maybe it will become a fun hobby for you? A hobby that will serve you well when you need it to. To recap what has been discussed here in this article, it is my opinion that if you would like to learn the Swedish language or any other language, the first thing you will need to focus on is your own complete desire to do so. That is what will push you forward in the process. A sheer determination to achieve something that you start. Also, something that will likely benefit you as our future here continues to grow globally in the travel and communication realms. Can you learn Swedish in a year? Better yet, can you learn any language set to your own timeframe and aspiration to do so? It’s an exciting challenge question if you are really thinking about expanding your cultural horizons, isn’t it? Finally, why not take an opportunity to learn something worthwhile that will help you keep up as we move swiftly into the future. The world and the people in it are growing in a special way. We see others and their traditions as a driving curiosity of how we connect. A lot of us around the globe are already attempting to learn all we can about our cultural differences. So, let us try to make every language a universal language.